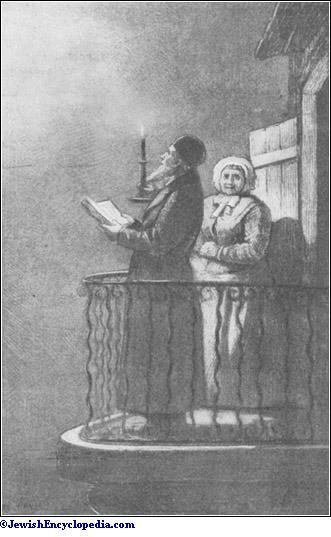 One of the first Jewish settlers of New Amsterdam, as New York city was known under the Dutch; probably born in Amsterdam; died in 1680. He is first mentioned as one of the Jews who went to New Netherlands in 1654, probably as refugees from Brazil. From the start Levy was one of the champions of his people, never permitting an injury, however slight, to pass without protest. In 1655 Peter Stuyvesant, the governor of the colony, was ordered to attack the Swedes on the Delaware, and accordingly issued orders for the enlistment of all adults. Several Jews, among whom was Asser Levy, appear to have been ready to serve; but the governor and council passed an ordinance "that Jews can not be permitted to serve as soldiers, but shall instead pay a monthly contribution for the exemption." Levy and his comrades at once refused to pay, and on Nov. 5, 1655, petitioned for leave to stand guard like other burghers or to be relieved from the tax. The petition was rejected with the comment that if the petitioners were not satisfied with the law they might go elsewhere. Levy successfully appealed to Holland, and was subsequently permitted to do guard duty like other citizens. "Blessing of the New Moon." As Levy appears also as a prominent trader at Fort Orange (Albany), it is likely that he was responsible for the rebuke given to Stuyvesant by the directors in Holland during the same year because of his refusal to permit Jews to trade there. Levy was also one of the first licensed butchers in the colony. In 1657 the burgher right was made absolutely essential for certain trading privileges, and within two days of a notice to that effect Asser Levy appeared in court requesting to be admitted as a burgher. The officials expressed their surprise atsuch a request. The record reads: "The Jew claims that such ought not to be refused him as he keeps watch and ward like other burghers, showing a burgher's certificate from the city of Amsterdam that the Jew is a burgher there." 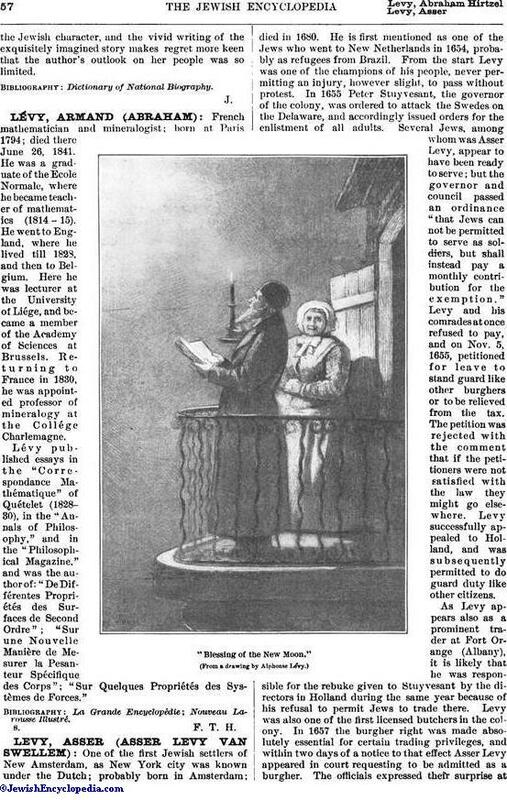 The application was denied, but Levy at once brought the matter before Stuyvesant and the council, which, mindful of the previous experience, ordered that Jews should be admitted as burghers (April 21, 1657). As early as 1661 Levy purchased real estate at Albany; he was also the earliest Jewish owner of real estate in New York city, his transactions there commencing in June, 1662, with the purchase of land on South William street. Within ten years of his arrival Levy had become a man of consequence, and when, in 1664, the wealthiest inhabitants were summoned to lend the city money for fortifications against the English, he was the only Jew among them: he lent the city 100 florins. It is as a litigant, however, that Levy figures most prominently in the Dutch records, his name often appearing for days in succession. He invariably argued his own case and was almost invariably successful. Only on two or three occasions did he figure as defendant. No other Jew seems to have had so many dealings with Christians, or to have been on more intimate terms with them. As a litigant he is named also in the records of Gravesend in 1674. Levy's trading relations extended to New England, and he frequently appeared as attorney for merchants in Holland. In 1671 he lent the money for building the first Lutheran church in New York. About 1678 he built a slaughter-house in the east end of what is now known as Wall street, where he appears to have been the owner of a famous tavern. Instead of being unpopular on account of his many lawsuits, the contrary seems to have been the case. The confidence reposed in his honesty by his Christian fellow citizens appears frequently from the court records. Property in litigation was put into his custody; he is named as executor in the wills of Christian merchants, and figures as both administrator and trustee in colonial records. 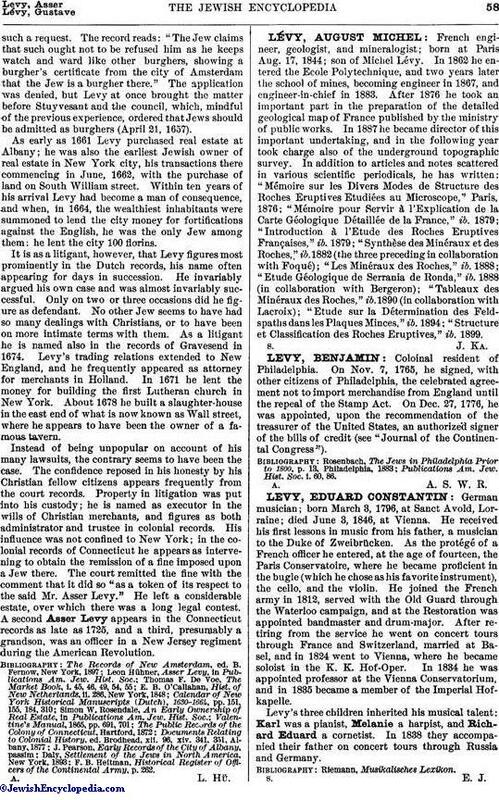 His influence was not confined to New York; in the colonial records of Connecticut he appears as intervening to obtain the remission of a fine imposed upon a Jew there. The court remitted the fine with the comment that it did so "as a token of its respect to the said Mr. Asser Levy." He left a considerable estate, over which there was a long legal contest. A second Asser Levy appears in the Connecticut records as late as 1725, and a third, presumably a grandson, was an officer in a New Jersey regiment during the American Revolution. F. B. Heitman, Historical Register of Officers of the Continental Army, p. 262.